This skin is just the standard Opera 9.5 skin with a Lite style. The dark tabs have been changed to bright clean tabs and a few other areas have been brightened. 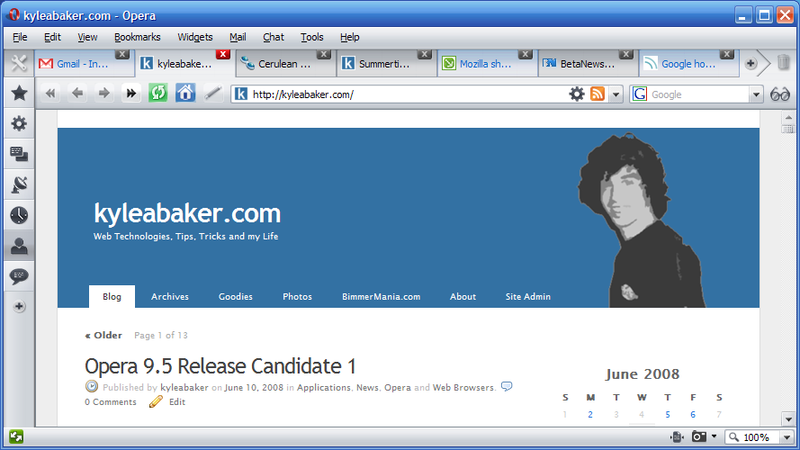 -Fix the toolbar used in Mail, IRC and Tools tabs to blend smoothly. -Added a little more notification when a window calls for attention. The tab now changes shades to a blue tint. -Added a bottom border to the tabs that are not active to increase usability and appearance. -Set “Fallback foreground = 1” and “Fallback background = 1” after being contacted by Opera about them cleaning up and improving their skin selection. I bookmark this site already! Could you make slim vesion of this skin? Version 1.03 is now available and the changelog is above. Enjoy.